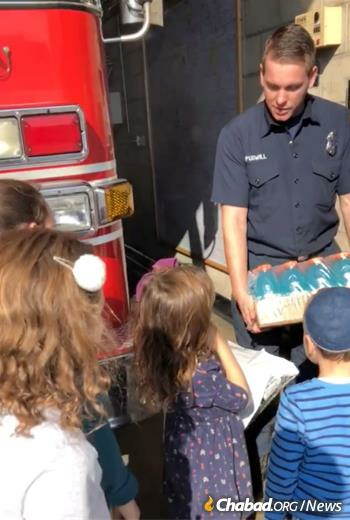 Chabad of the Valley and Chabad at Porter Ranch team up to take food and drink to firefighters. Voices filled with emotion, Chabad rabbis from across California made clear their determination to help people in need while dealing with the devastation a weekend of at-times uncontrollable fires has wrought on their hometowns. “Paradise is a part of our community,” said Rabbi Mendy Zwiebel of the town in Northern California where at least 48 people have been killed as the Camp Fire decimated all of structures in its path. “We had people over for Shabbat who lost everything. This wasn’t expected. On Thursday morning, we woke up and heard [about the fire]. In just a few hours, the whole town was wiped out. As many as 8,000 firefighters are reported to be battling the wildfires as of Monday. Residents of Chico opened their doors to their neighbors, but many families who lost their homes are staying in packed evacuation centers, and “sadly, many, many people are camping out in parking lots,” said Zweibel. “People donated clothing and food, and the Red Cross is helping out. For the time being, people’s needs are being dealt with, but some don't have insurance” the rabbi continued, adding that those who are staying with friends and family will be doing so for the long term. Nearly 500 miles to the south, residents of Malibu, Thousand Oaks, Oak Park, Calabasas, Westlake Village and other nearby towns are waiting for word about when they can return home, and if they still have a home as the Woolsey Fire, which began on Thursday, is still burning. As of Sunday afternoon, the fire had taken two lives, destroyed some 177 homes and burned 83,400 acres. With a “Red Flag Warning” in effect and heavy winds expected over the next 36 hours, the danger is far from over. Cunin himself hasn’t been home in days. He and his family left on Friday when a mandatory evacuation order was put into place. 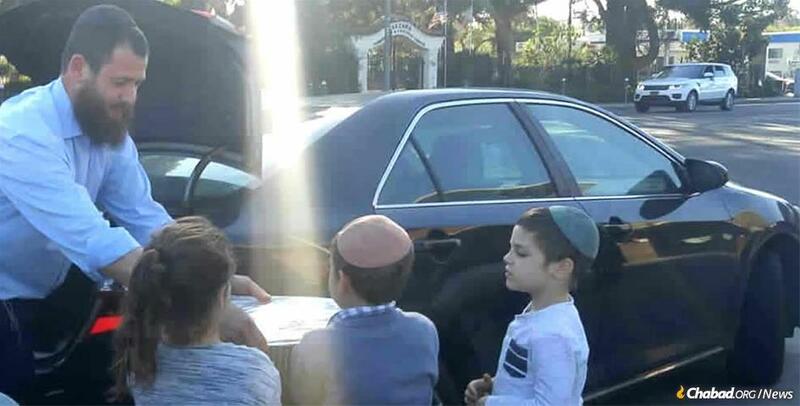 Taking the congregation’s Torah scrolls with them, he and his family have been staying at Chabad of Pacific Palisades just a few miles down the road. The Simons family brings drinks and food to firefighters. The communities of Thousand Oaks and adjacent Westlake Village were still grappling with Wednesday night’s deadly mass shooting of a dozen people at a local bar—including a sheriff’s officer and many young adults—when police began driving around with bullhorns ordering people to evacuate. Though Sapochkinsky and his family are far from home—they are staying with family in Rancho Mirage some 140 miles away, as the evacuation order remains in effect for Westlake Village—he believes that both his family’s home and the Chabad House are OK.
Shula Bryski, co-director of Chabad of Thousand Oaks with her husband, Rabbi Chaim Bryski, noted that dark times really highlight the important message of the Lubavitcher Rebbe—Rabbi Menachem M. Schneerson, of righteous memory. With the mandatory evacuation order for their neighborhood lifted, the Bryskis went home to Thousand Oaks to lend a hand to those in need. 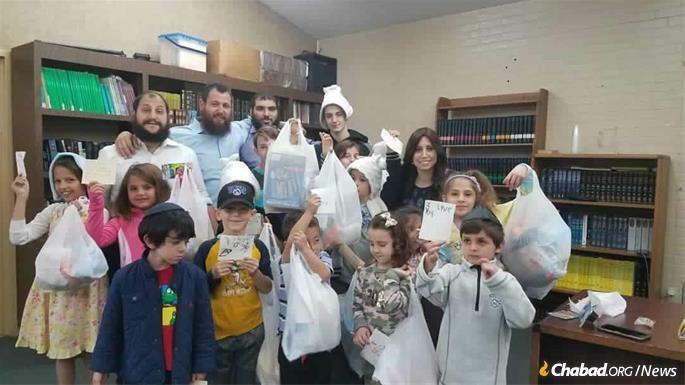 Students of the Ryzman Family Hebrew School make care packages for kids effected by the Woolsey Fire. That they returned so quickly to help the community isn’t a surprise to Thousand Oaks resident Cathy Cole, who works as an oncology nurse in the Los Robles Regional Medical Center. Cole said the last few days have been extremely tough on people in her town. Still, like others, Cole said she’s seen good come from the bad. “Everyone is asking, whether you are in a store trying to buy groceries or at work, ‘How are you? Is your house OK? Do you need anything? Everyone is going out of their way to help strangers. Despite the devastation, Rabbi Bryski feels G‑d is watching out for people. For instance, he said, the Ventura County fire chief, Mark Lorenzen, put on tefillin for the very first time in his life just hours after the deadly massacre and just hours before the start of the fire. The Chabad Center of Agoura Hills will be opening its doors to provide materials, gift cards and other necessities to people who have lost their homes, regardless of their religious affiliation.